ALEXANDRIA, VA, OCTOBER 1, 2015 – Statistics is one of the fastest-growing degrees in the U.S., but the growth may not be enough to satisfy the high demand for ­­statisticians in technology, consumer products, health care, government, manufacturing and other areas of the economy, an analysis conducted by the American Statistical Association (ASA) finds. Data recently released by the National Center for Education Statistics shows bachelor’s degrees in statistics grew 17% from 2013 to 2014. This marks 15 consecutive years the number of undergraduates in statistics has risen, increasing by more than 300% since the 1990s. For comparison, the number of undergraduates earning science and engineering degrees grew by 72% over the same period. From 2000 to 2014, master’s and doctorate degrees in statistics also grew significantly at 260% and 132%, respectively. Yet demand for statisticians is likely to continue to outpace this growth. In a 2011 report, McKinsey Global Institute stated a “significant constraint on realizing value from Big Data will be a shortage of talent, particularly of people with deep expertise in statistics and machine learning,” and predicted a potential shortage in the U.S. of 140,000 to 190,000 workers with deep analytical skills by the year 2018. It also warned of an additional shortage of 1.5 million managers and analysts who can use the analytical output of Big Data for decision-making. The number of graduates in statistics each year—approximately 2,000 bachelor’s degrees, 3,000 master’s degrees and 575 doctorate degrees—seems unlikely to match this demand. This dynamic has led many colleges and universities to expand existing programs. Harvard University, for example, has seen enrollments in its statistics department courses more than double since 2005. 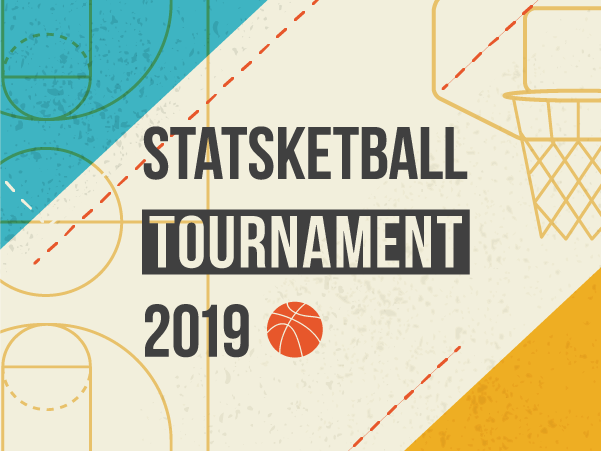 Joe Blitzstein, Harvard University co-director of undergraduate studies and professor of statistics, says enrollment in his course, Stat 110, has increased six fold since 2005. “More and more employers are recognizing the invaluable skills of statisticians in today’s data-intensive world. 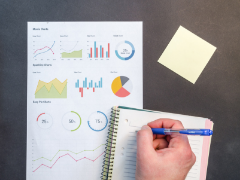 More and more students are realizing the power and versatility of a statistics degree or training for pursuing a wide range of careers, from data science and finance to health and the environment,” says Blitzstein. 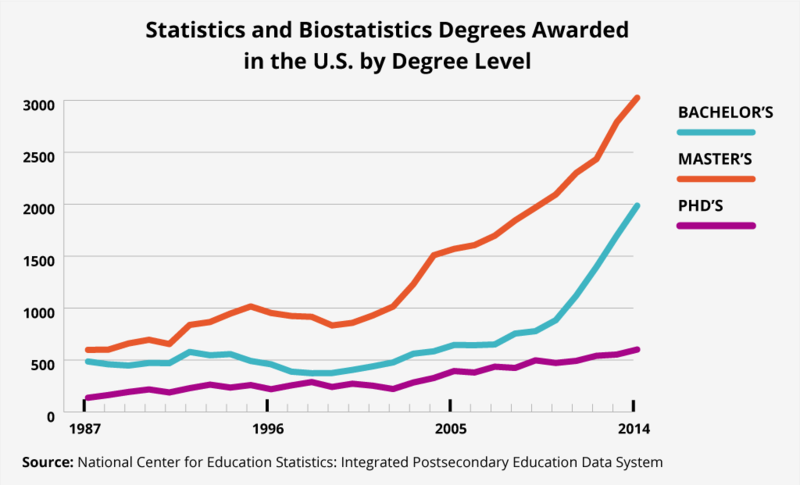 The number of universities granting degrees in statistics also has grown, increasing by 50% for bachelor’s degrees and 20% for master’s degrees from 2003 to 2014. For the first time, degrees in data science are being offered. Six universities recently established such programs, including the University of Michigan and the University of California, Irvine. Statisticians and data scientists also are earning strong wages, another indicator of high demand. BLS data reveal the mean annual salary for statisticians is $84,010 and tops six figures in many metro areas such as Raleigh, North Carolina ($103,900); Bethesda, Maryland ($109,280); and Silicon Valley, California ($150,390). A 2014 report by recruitment firm Burtch Works reports the median salary for data scientists was $80,000 for those with less than three years experience and $150,000 for those with nine or more year’s experience. Many other sources are also recognizing the increasing demand for statisticians. Last year, LinkedIn named “statistical analysis and data mining” one of the “hottest skills that got people hired.” In addition, job site CareerCast and advocacy organization Young Invincibles recently named statistics in separate reports one of the best careers for millennials based on factors like pay, growth and job satisfaction. The American Statistical Association is the world’s largest community of statisticians and the second-oldest continuously operating professional society in the United States. Its members serve in industry, government and academia in more than 90 countries, advancing research and promoting sound statistical practice to inform public policy and improve human welfare. For additional information about the American Statistical Association, please visit the ASA website at www.amstat.org.